Preheat oven to 350 degrees. Cook pasta according to package directions. Drain and set aside. Place frozen broccoli florets and sugar snap peas in a saucepan, cover with water, and bring to a boil for 3 minutes. Drain. Mix with cooked pasta in an 8 x 8 casserole. 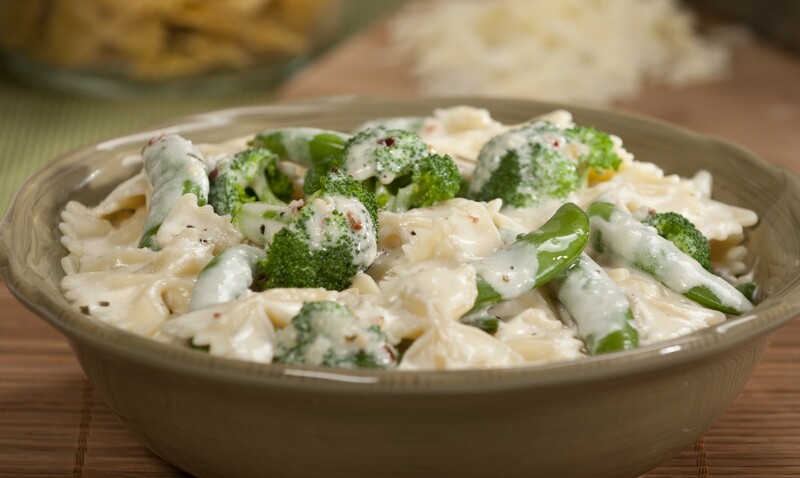 Pour Alfredo Sauce over pasta and vegetables and top with cheese. Bake at 350 degrees for 15 minutes or until cheese is bubbly and slightly brown. This delicious creamy dish is hearty enough to be enjoyed on its own. It also makes a great accompaniment to your favorite meat.